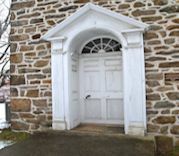 From the moment you walk through the door of the 1803 House, you can almost feel what it was like in Emmaus at the turn of the 18th century. Take a stroll down our new brick walk, step on the porch and come on in. Close the door behind you and look around the kitchen. See the glowing fire in the fireplace. You can actually feel the warmth and comfort that Jacob Ehrenhardt, Jr.'s family may have felt back then. The dining room was the principle eating, social and working room in the house, where the family gathered for meals and might have received guests. The girls would have practiced their knitting and embroidery here. A spinning wheel would have been there, as well as a "kas", or storage closet like the one in the upstairs front bedroom. Note the "show towels" hanging on the door which was a way to display their handiwork. During restoration, the chair rails were scraped to reveal the mustard color which they’re painted today. This was a color common in German decorating for the period. From the dining room you can walk directly into the parlor and then back into the hallway. It was originally thought that this room was the parents' bedroom or the "kammer", a custom brought along with the early settlers. But Jacob designed his home along more "modern" lines, and not the traditional three-room plan. So, we now believe this room to be a fashionable parlor. The fireplace was for warmth. The idea of "central heat" didn't come along till the mid 1800's. Thus the patched cut-out in the floor, an earlier cast iron grate allowing heat from a stove in the basement to rise up through the first floor. Another strong feature marking the house as a Federal style is the carving style on the fireplace in the downstairs parlor and the upstairs front bedroom. This bedroom Is decorated as a child's room. An “Anna Eleonora” water color, which is an original, is on the wall at the window looking toward the area where the barn was. It's believed that the barn burned down as a result of sparks form the passing wood-stoked steam engine. The artwork is from “Anna Eleonora’ s Special Day”, written by Corrine Durdock and illustrated by Kathryn Schaar Burke. There are “beaded” edges on all of the beams, marking them as originally exposed. Have you ever heard the saying "sleep tight, don’t let the bedbugs bite”? 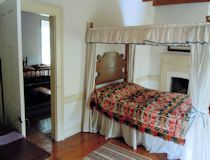 The rope beds, with ropes in place of more modern box springs, need to be kept tightened and the bugs were probably a constant whether the mattresses were filled with straw in this bedroom or feathers in the canopy bed in the front bedroom. From the girl's bedroom walk through the door and go directly into what we assume to be Jacob and Suzanna's bedroom. The canopy bed was designed for warmth in the winter and the “bed curtains” to hold in the heat. There were no closets in homes during this time period so there were many storage chests throughout the house. This bedroom had a fireplace and it is almost in its original condition and is what the downstairs parlor fireplace should look like with interior plaster and not exposed brick or stone masonry.The ceilings were originally as you see them today, with exposed beams and wide plank floors typical of the18th century colonial architectural style. From the second floor hallway you can enter the attic...let's go on up. 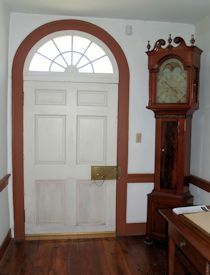 The attic door is one of the two remaining original doors in the house. The original doors are identified by the subtle ridges in the surface of the wood, the marks of hand-planing. Originally, the roof would have been wood shingles, probably oak. Slate came along much later as a building material in the valley. 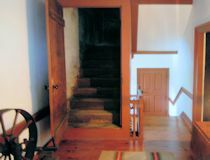 The top step into the attic is short, which is also in the kitchen attic. This represents the new 2x4 framing and plywood installed during the 1970’s restoration to allow for installing insulation. The attic was most likely used for drying herbs or storage. However, the patched-up stovepipe hole in the east chimney is curious...was there a stove for a bedroom? If so, was the bedroom for a house servant? At the first landing of the attic you’ll see a tiny child's handprint pressed into the plaster. It was one of the daughter's but why 6 fingers? There are Roman numerals stamped into the timbers. This allowed for rafters and beams to be cut and “dressed” on the ground outside with all of the mortises and tenons matching up, and then raised up to the attic for installation, similar to an Amish barn raising. It’s rough looking, but very skillfully done. There is an access panel near the peak of the roof, on the Keystone Avenue side, which was to get up on the roof for repairs. From a window you can almost see Jacob's father’s farm in the southwest, towards Gottesacker, or God’s Acre...where Jacob, his parents and many other early settlers were buried, near the site of the original Moravian Church. Step inside and go back in time to the early 1800's after the Moravians had settled in Emmaus.The house preserves the architecture of the Moravian culture of Colonial Pennsylvania and illustrates the lifestyle of Colonial America. This beautiful renovated "time capsule" of the past is a vital link to our heritage and one of the oldest structures in the borough of Emmaus. Year-round guided tours of the 1803 House for groups or individuals are available. Cost is $25.00 per group or $2.00 per person. For more information on scheduling email us at tours@1803house.org.